I started the week off at the Kentucky State Fair to judge the knitting entries. This year we started a new procedure where we provide comments for the knitters. I hope they find it helpful! I went from the fair to Granville, OH for the photo shoot for the Winter issue of Cast On. We had a wonderful site. The light was excellent. 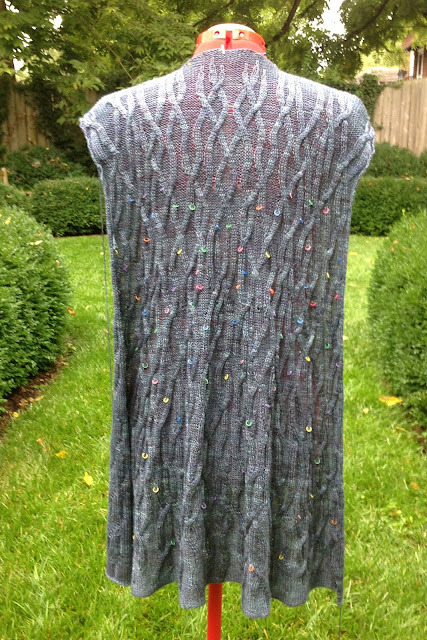 Here's a photo I took of my pleated sweater. The model was adorable and so sweet. I only took a photo of my garment as I don't want to ruin the surprise. The Stitch Anatomy lesson is on pleats and the Fashion Framework is felted purses. It was a slow week. I only had three lessons to review. I do have quite a few new students. I've never had a student from Peru before. I look forward to working with them all. Last week I discussed general tension problems in stockinette. 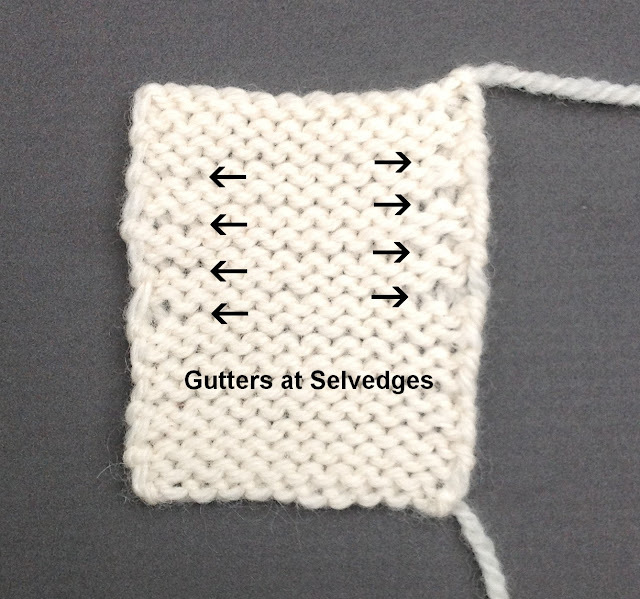 Many knitters (including me) have problems at selvedges. When you begin and end rows with different tension the first few stitches at the beginning or end of rows are overlarge. Generally after the first few stitches you get into a rhythm. 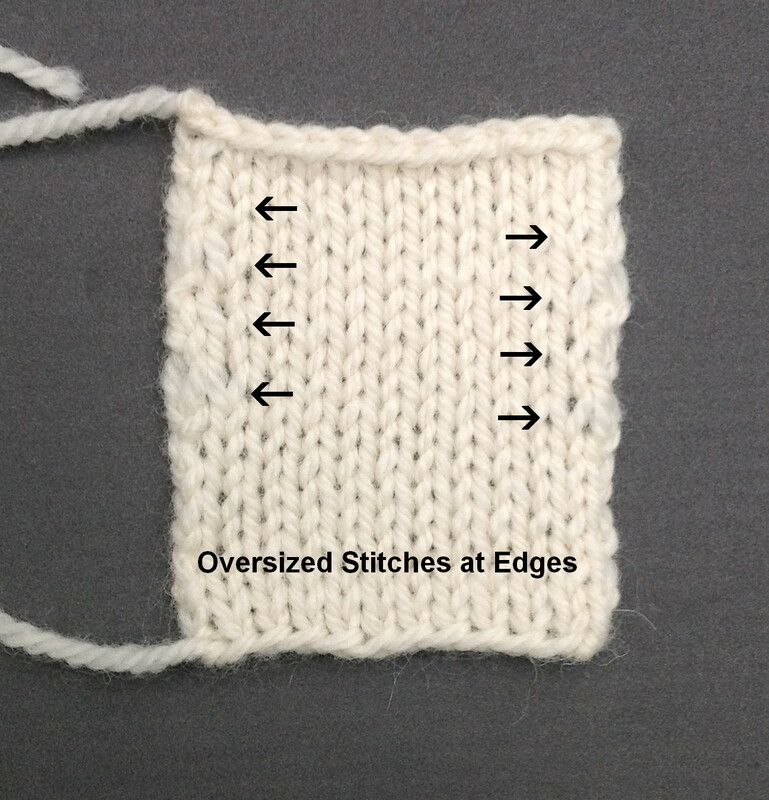 The photos show oversized stitches at both edges. Most knitters only have a problem at one side or the other. Why is this a problem? Think about how this edge would look in a seam or at the side of a button band. It just looks awful. To solve this problem you first have to figure out where you are looser. In most cases if the tension issue is at the right, the knit stitches are large. 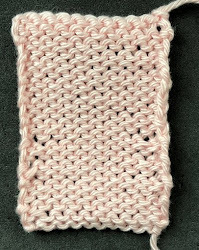 If it is at the left, the purl stitches are large. To make sure, cast on 12-20 stitches and work a few rows. On a knit row, put a safety pin in one of the stitches. Continue to work a few more rows and you can see where the problem is. There are many different solutions you can try. Avoid the temptation of really pulling the working yarn tight when you work the the first two or three stitches. Yes, it will make those stitches some what smaller but what it also does is pull the yarn from the end of the last row making those stitches even smaller. After you've knit the first two or three stitches, you can try pulling the yarn tight. This sometimes works to make those stitches a bit tighter. What works for me is to use combination knitting for the first stitches in a row. Wrap the the first few stitches in the row the wrong way (over the needle for knit stitches and under the needle for purl stitches). If you do this, remember you have to work those stitches through the back. Some knitters can solve this by just paying attention as they begin rows. Yarn can be a contributing factor. I always have tension issues when I use high twist yarn like Debbie Bliss Rialto. When you are trying to solve a tension problem, don't try different solutions on the same swatch. Make one for each attempt. This way you can analyze and compare the swatches. If you only the stitch next to the selvedge is the problem Maggie Righetti has a solution. Work the selvedge stitch but don't take it off the needle. Insert the needle into the second stitch and give the working yarn a bit of a tug. This not only neatens up the selvedge stitch but also the stitch next to the selvedge. By the way, blocking cannot solve tension problems. If you are doing the Masters Program, this is something you must solve. For other projects, just be careful about the yarn you select. To me, the most difficult thing in the world to knit is a project in stockinette stitch with white cotton yarn! Salon this week will be on Saturday. Summer is pretty much over here. The schools started on Wednesday and UK starts next week. I did finish the back of my sweater and have blocked it. I am about half way finished with the fronts. I'd like to finish them this week and tackle the sleeves. The free form cables are supposed to be snakes. I am going to use this same yarn (Briar Rose Sea Pearl) for a skirt. The drape is fabulous. Since it will be in the Spring issue, I'd like a lighter weight skirt for the lesson. I'm going to do another skirt in Kauni Effekts which will be heavier. The "tension" issues at the end of the row have to do with the fact that each stitch is stretched slightly as it is worked but is corrected when the next st is worked because when that st is pulled to be a bit larger, it takes the extra ease from the st that was just worked. When you get to the end of the row, the next st is on the row below and thus does not get worked, so the extra ease that has accumulated across the row stays in those last few sts. It has very little to do with the knitter not having "their rhythm" at the beginning of the row. When you knit in the round, if you look at the bindoff, the last sts worked are always bigger, demonstrating what I'm talking about. You can avoid this somewhat by delicately working your sts at the tips of the needles rather which are smaller and thus stretch the st being worked out of shape to a lesser degree. But beyond that, it is simply due to the mechanics of knitting, not unlike the fact that knitting stretches (vs woven fabric, which doesn't). cách khác, chúng chỉ là một loại sinh vật tà ác .